Just because it’s a barn kit, doesn’t mean it has to be standard. Personalized kits are just as original as custom builds, and they save you time and money. When you choose DC Structures, you’ll be guided through a streamlined hands-on process to select and modify your kit. We celebrate your individuality, and we want to give you the tools you need to make your kit your own. The DC Structures portfolio of personalized kits is as diverse aesthetically as it is structurally. As you’ll see, there’s not much we aren’t willing to accommodate for our clients. The ability to personalize your structure starts with deciding on a kit model and size. Our experienced team of project specialists will work with you to determine the model that will best meet your needs. We get a lot of clients who come to us with a particular kit in mind. However, once we dig a bit deeper, we often discover that another model would be much better suited for their needs. Our collective experience getting to the heart of our customers’ lifestyles helps us to steer you toward the perfect package. Our selection of options and upgrades ranges from the purely aesthetic to the structurally necessary. We can accommodate different heights and widths for your structure, as well as increased wind and snow loads. Choose from our Andersen window packages and Pacific Northwest knotty alder wood doors. All our door and window offerings are top quality, adding more value and a boon to the appearance of your structure. Building a barn? 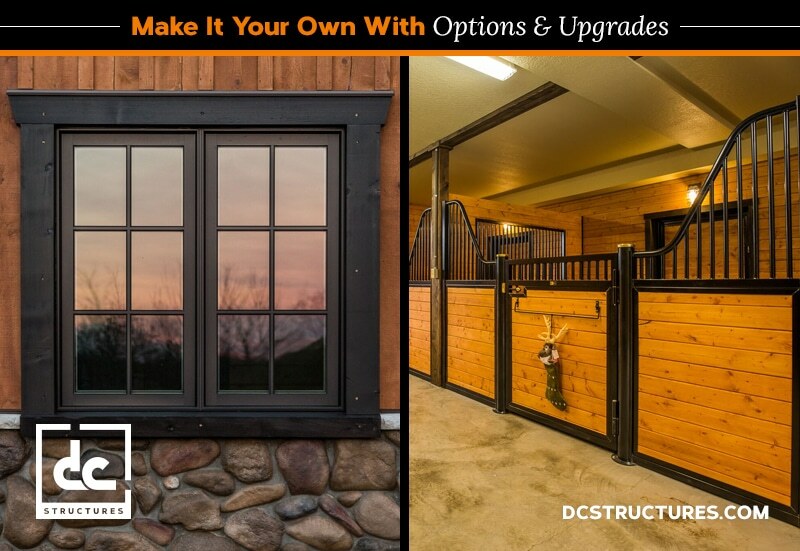 We offer a stellar selection of Classic Equine stall fronts that are both elegant and durable. From standard stall fronts to Euro-style and Legend-style, we can help you choose the stall doors that complement your desired aesthetic. If, for whatever reason, a client is dissatisfied with our upgrade offerings, we are happy to credit those materials so they can source what they want themselves. Take a look at our catalog for more information on how you can personalize your kit.